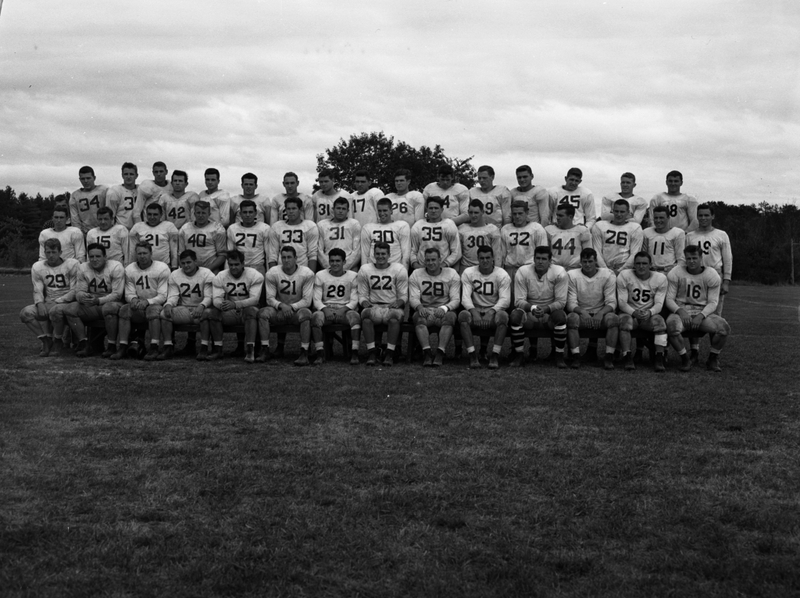 photo of 1949 Bowdoin football squad: Front Row: Williams J. Reardon, John J. Butler, Alfred N. Nicholson, J. Ward Stackpole. Lyle W. Sweet, Jules F. Diroy, Dominic P. Toscani, Benjamin M. Smethurst, Charles W. Lovejoy Jr., Co-Captain David F. Burke, Co-Captain James H. Sibson, Robert E. McAvoy, Henry F. Daley Jr., James Schoenthaler. Second Row: Richard A. Rosse, Robert E. Graff, Leland B. Howe, Robert C. Gulian, Agisilaos J. Pappanikou, James L. Fife, William H. Clifford, Robert W. Speirs, Charles M. Ericson, Jack A. Bump, Richard S. Vokey, Edward W. Rogers, Charles A. Bradley, Robert S. Carley, Charles D. Scoville.